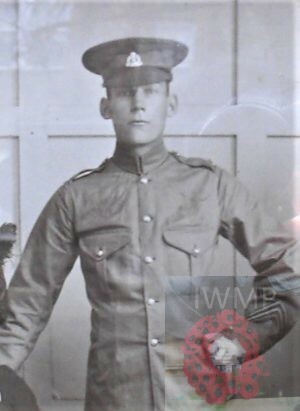 Died: 20th July 1916; age 25; KiA. 1891 Cliff Road, Waldringfield, Suffolk. Fred was 2 months old and living with his parents & siblings. Walter Brown, 46, a Labourer – Cement Works, born Martlesham, Suffolk. Emily Brown (nee Beer), born Hintlesham, Suffolk. Frances Brown, 21, born Martlesham. Arthur Brown, 11, an Agricultural Labourer, born Martlesham. Walter Brown, 9, born Waldringfield. Florence Katie Brown, 7, born Waldringfield. Grace Eliza Brown, 5, born Waldringfield. Ellen Brown, 4, born Waldringfield. Alice Louisa Brown, 3, born Ipswich. John Brown, 1, born Waldringfield. 1901 Cliff Road, Waldringfield, Suffolk. Fred was 10 years old and living with his parents & brother. Walter, 56, a General Labourer – Cement. 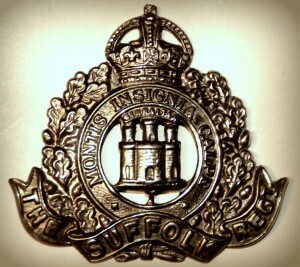 Fred was 20 years old, a Soldier ranked Private in the 1st Battalion, of the Suffolk Regiment. Soldiers’ Effects to Lily Brown – widow. 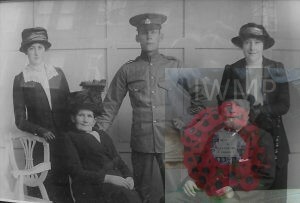 Fred in uniform with his parents Walter & Emily (seated), and his wife Lily, and mother-in-law.